Part of being a parent means becoming educated on common childhood diseases: Red itchy spots are a sign of chicken pox, untreated whooping cough could lead to severe health problems… But what about the potential damage caused by poor dental hygiene? 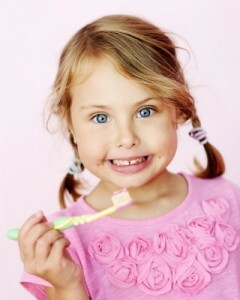 According to Healthmad.com as many as 28% of children ages 2 to 5 have cavities in their baby teeth. While there are many factors that may contribute to this statistic, one of the more common reasons is poor eating habits. Many of the foods that children enjoy eating lack the minerals and vitamins needed to grow and sustain healthy teeth and gums. Parents can help prevent the development of cavities by making sure their children are brushing after meals, flossing regularly, and getting fluoride treatments. It is recommended that a dentist appointment be scheduled as soon as your child’s first tooth appears. Regular dentist visits will help your child understand the importance of proper dental hygiene starting a young age. Learn more about dental hygiene from Academy of General Dentistry. Flouride treatments are a great way to prevent the development of decay and has been shown to reduce cavities by 67%. We recommend that children get flouride varnish applied during their well-child check-ups at 9 months, 12 months, 15 months, 18 months, 2 years and 3 years. Click here to find out how you can have a flouride varnish application for your child at a well-child office visit. Call us for an appointment at (512) 733-5437.